Handy Father was approached recently by a new type of flower delivery service. It is near Mother’s Day, so it seems a perfect fit to talk about now. I don’t usually get into the whole flower market a whole lot because you never know what you’re going to get. 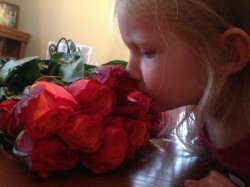 Sending online flowers has never been easier than with The Bouqs service. 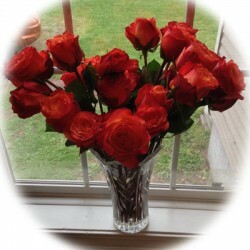 I clicked the “Just Because” link on the website, and found a beautiful bouquet of roses to buy for my wife. Once I added it to the cart, I found that every order has free shipping and it was very simple to navigate! Register with The Bouqs & receive 20% Off your next order + Free Shipping! Get your discount code and send gorgeous flowers today. Click here! The Bouqs website lists two options for flower locations. The first option is for delivery from a fully-sustainable volcano side farm which is located next to the equator in the perfect environment for growing amazing flowers. The second option is for next-day service, at least in the U.S., and is located in California. When I made my flower purchase, I chose the Volcano-side location, and bought a bouquet called Dawn Deluxe. 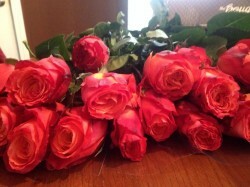 It is an arrangement of orange roses. When the Bouquet arrived, I was shocked to see how well-packaged it was, and the simple care instructions that came with the flowers made the whole process a joy. 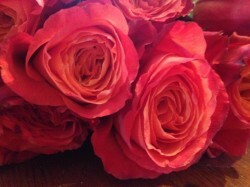 These roses are very fragrant, and every bloom is perfect! I would never have thought this possible with a product delivered across the globe, but I will certainly order from thebouqs again! Sending online flowers has never been easier.